Getafe 2-3 Real Madrid. Cristiano Ronaldo scores another two goals. 03.01.2011 »» Getafe 2-3 Real Madrid. Cristiano Ronaldo scores another two goals. Jose Mourinho's side reduced to ten men in the second half were still able to bring home a victory, after Cristiano Ronaldo scored 2 more goals. 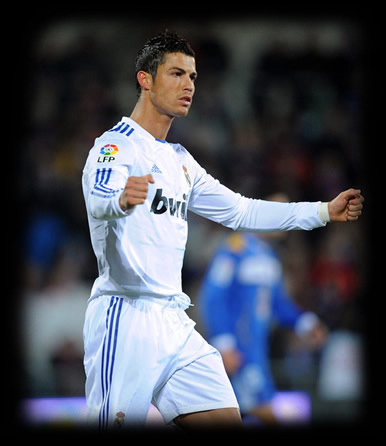 A Cristiano Ronaldo brace helped Real Madrid on their way to a 3-2 victory over Getafe at the Coliseum Alfonso Pérez. The Portuguese slammed home an eleventh minute penalty before Mesut Ozil doubled the lead eight minutes later. But Getafe pulled one back thanks to a Dani Parejo wonder goal, however Ronaldo got his second after a loss of concentration from goalkeeper Jordi Codina. Then Juan Albin smashed home from close range to set up a tense finish. Jose Mourinho made some enforced changes at the back as Ricardo Carvalho and Pepe were both suspended. So Sergio Ramos moved into the centre of defence, partnering Raul Albiol, with Álvaro Arbeloa coming in on the right side. There was no place for Kaka in the starting eleven but the Brazilian did manage a place on the substitutes bench. Real Madrid started the game in dominant fashion with Ronaldo clearly in the mood as his early run into the box led to a big penalty shout, but replays showed the Portuguese had lost his footing. Moments later Ronaldo saw a long range free kick fly just over, then an acrobatic overhead kick go wide of the goal. However, he was to get his goal not long after. Angel Di Maria was allowed to dribble into the Getafe penalty area and as he went past Mane, the left back stupidly pulled him to the ground. The referee pointed to the spot immediately. So, Ronaldo stepped up and smashed the penalty into Codina's right-hand corner. It was two-nil not long after as Real Madrid continued to dominate the game, with Di Maria involved once more as he cut inside from the right before playing a delightful through ball to Ozil. The German made no mistake and rounded Codina before slotting home at the near post. Credit must go to Getafe who responded brilliantly as Pedro Ríos, Manu and Parejo started to cause the away side problems. Then after a sustained period of pressure they finally managed a breakthrough. Parejo slalomed past Arbeloa and Diarra before letting fly past Casillas. It was just rewards for the home side. From then on the Azulones dominated proceedings and were unlucky not to get an equaliser before half-time. After the break it was more of the same from Getafe as they took the game to Los Merengues with Jaime Gavilán testing Casillas from range. However, Real Madrid managed to get a third completely against the run of play after Karim Benzema pounced on a poor clearance by Codina before playing Ronaldo through for his second of the game. Now playing exclusively on the counter attack, Real Madrid had a wonderful opportunity to wrap up the game when Di Maria was sent clear on goal, but he tried to play in Benzema but he fluffed the chance to shoot and Codina eventually gathered the ball. The Frenchman was played through once more, but this time his shot smacked the post and went wide, much to the frustration of his manager. But the moment everyone had been waiting for came on 75 minutes when Brazilian superstar Kaka was introduced by Mourinho to end to five months of injury problems. Arbeloa was then sent off with ten minutes left for hand ball and three minutes later Getafe pulled a goal back thanks to substitute Albin after a Pedro Mosquera cross hit Marcelo directing the ball into the scorers path. Despite applying plenty of pressure to Casillas' goal the home side could not find an equaliser and remain in seventh place. Real Madrid are also non-movers in second, two points behind leaders Barcelona. .